Scientists have grown “mini-organs” in vitro that can restore insulin production. For decades, researchers sought to replace beta-cells, the insulin-producing pancreatic cells, that are lost in diabetes. Ultimately, such an ability would give us a way to combat diabetes in a truly permanent way. Today, a breakthrough published in Cell Stem Cell reveals that a tissue discovered in the lower stomach seems to be the key to achieving this momentous breakthrough. After their discovery, the researchers took samples of this specific tissue from mice in an effort to reprogram it into a beta-cell state. They then grew the tissues into “mini-organs” that successfully produced insulin when it was transplanted back. The stem cells from the engineered organs also replenished the beta-cells, which means the tissue can sustainably regenerate. 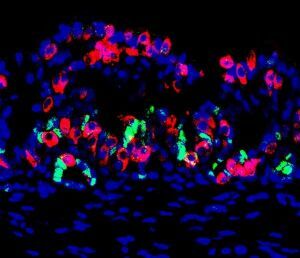 To test its effectiveness, scientists destroyed the insulin-producing beta cells in the test mice. They then transplanted the engineered organs into a membrane in the mice. Results showed that the transplanted organs were able to compensate for the loss of insulin and maintain the glucose level of five out of 22 experimental subjects. So of course, the work isn’t ready ready for human testing; however, the work is still in its very earliest stages. Researchers are, of course, hoping that these findings will eventually be translated for human application, at which point, the approach will allow doctors to create tailored therapy for different patients based on biopsies. They can simply take tissue from the patient for analysis and grow the cells in a lab and reprogram the cells to produce beta-cells. Once ready, they can easily transplant the cells into the patient.